Great trip. Our guide let us pick and choose our stops so we got some extra time to walk the beach. Lunch at the Bruny Hotel was outstanding along with the beer/cider/cheese tastings along the way. 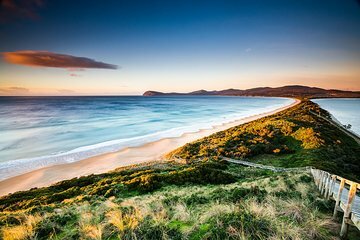 Bruny Island is a paradise that you must see and do while in Tasmania. So thankful we chose Tassie Tours Tasmania for this excursion. Perfect mix of walks, nature, beaches and a chilled afternoon with a pub meal, cheese tasting and oysters to finish off a fantastic day. Patrick provided the perfect atmosphere. Engaged with everyone and got the van bopping around with some music and some fun and educational knowledge of Bruny Island and Tasmania. Highly recommend doing this trip.